Pavement ants control by Exopest Pest Control. Seeds and honeydew from aphids. Pavement Ants can become a nuisance if not controlled on time and with right preventive measures. When winged males and females swarm, their reproduction occurs. This is done in June and July. After mating, the females search out a new nesting site and become the queen for a new colony. 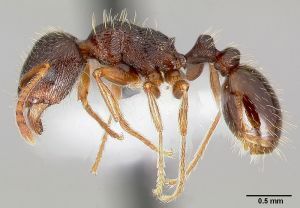 Pavement ants are not aggressive and don’t bite, although they have ability to sting. They are docile. Below are some key points that should be observed for Pavement Ants Control. Limit food and consumption to one or two areas of the home that are cleaned daily. Remove the materials such as piled lumber, bricks, stones, leaf litter, mulch, and other debris. Trim and cut the branches of trees and shrubs, and other plants or vegetation that may ant serve as highway. There are various way available to control Pavement ants but we recommend a bait treatment as the best control strategy that we learnt from our extensive experience, although this can be very challenging in getting ants to accept the bait product applied. We use special professional grade bait that only a certified professional can use. Baiting offers the ability for the worker ants to carry the product back to the nesting sites. Note: All products we use are approved from Government of Canada. Want to Get Rid of Pavement Ants ? In order to treat and get rid of pavement ant infestation properly, Contact Exopest immediately. For Pavement Ants Control, Our team and our highly qualified professionals will first inspect your property thoroughly inside and outside for mounds or other possible nesting sites. After the inspection Exopest will provide you with Evaluation and Quote. Call us at 604-740-1524 as soon as possible, when you notice the first infestation sign. Request a FREE Pavement ants control quote!